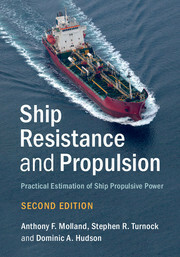 Ship Resistance and Propulsion Molland Anthony F., Turnock Stephen R., Hudson Dominic A. Authors: Molland Anthony F., Turnock Stephen R., Hudson Dominic A. Add to cart the livre of Molland Anthony F., Turnock Stephen R., Hudson Dominic A. This second edition provides a comprehensive and scientific approach to evaluating ship resistance and propulsion. Written by experts in the field, it includes the latest developments in CFD, experimental techniques and guidance for the practical estimation of ship propulsive power. It addresses improvements in energy efficiency and reduced emissions, and the introduction of the Energy Efficiency Design Index (EEDI). Descriptions have now been included of pump jets, rim driven propulsors, shape adaptive foils, propeller noise and dynamic positioning. Trial procedures have been updated, and preliminary estimates of power for hydrofoil craft, submarines and AUVs are incorporated. Standard series data for hull resistance and propeller performance are included, enabling practitioners to make ship power predictions based on material and data within the book. Numerous fully worked examples illustrate applications for most ship and small craft types, making this book ideal for practising engineers, naval architects, marine engineers and undergraduate and postgraduate students. 1. Introduction; 2. Propulsive power; 3. Components of hull resistance; 4. Model-ship extrapolation; 5. Model-ship correlation; 6. Restricted water depth and breadth; 7. Measurement of resistance components; 8. Wake and thrust deduction; 9. Numerical estimation of ship resistance; 10. Resistance design data; 11. Propulsor types; 12. Propeller characteristics; 13. Powering process; 14. Hull form design; 15. Numerical methods for propeller analysis; 16. Propeller design data; 17. Reductions in propulsive power and emissions; 18. Applications.